Our economy has been in a strong growth cycle ever since the Great Recession of 2007-2009. The Stock market has shown extremely good returns increasing 400% since March 2009. Corporate earnings are at an all-time high. Unemployment has steadily declined and our economy has been at “full-employment” since September 2015. Interest rates which had been at historical rates for several years, are starting to creep back up and the Fed is anticipating raising the Fed Funds rates three more times in 2018. 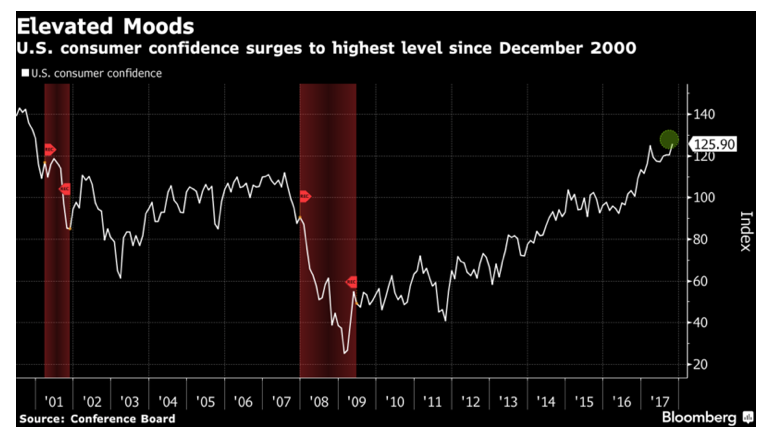 Even consumer confidence has risen to its highest level since Bush took office in 2001. If not for the Bush tax cuts that were made permanent by a GOP Congress, we’d have ended the Obama years like we did the Clinton years with a budget surplus and a real opportunity to start reducing our nation’s deficit. By every economic definition, our economy has been very strong since midway through the Obama presidency and continues its strong trajectory under Trump. 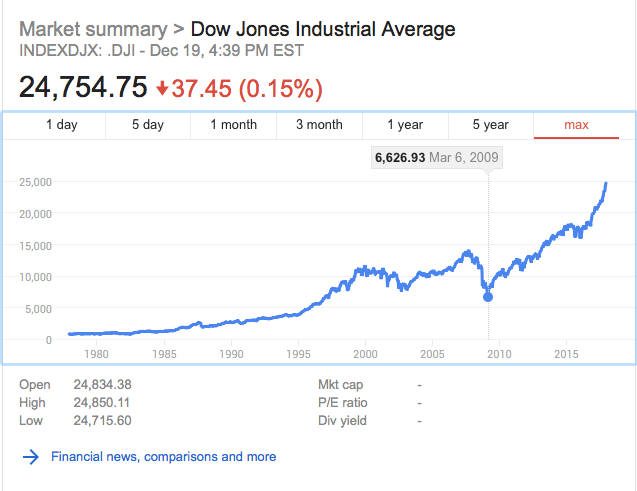 The DJIA has increased 400% since March of 2009 and the extraordinary bull market started in Obama’s second month. Consumer Confidence has been rising since Obama took office and is now the highest it’s been since before George Bush entered office. That is what is extremely strange about the urgency and rationalization of the new tax bill. At best, this bill will expand our economic growth slightly while increasing our deficit significantly. At worst, it will likely cause inflation (as measured by the Consumer Price Index*) to increase and interest rates to rise. This will benefit those who have investments as higher prices and profits are usually factored by markets well in advance of those returns actually being realized in corporate reports. Unfortunately for workers, higher prices and more expensive credit will wipe out any modest tax savings since wages significantly lag behind inflation. 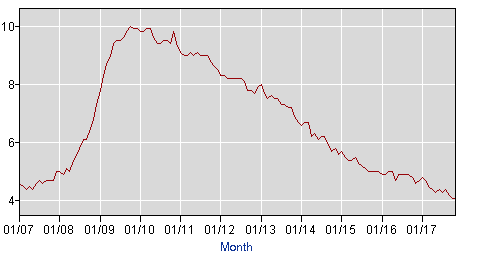 The Unemployment rate has been falling since the end of 2010 and reached “full employment” in September 2015. The economic growth we hear about has failed to “trickle down” to those of us who work for a living. Instead of raising wages, investing in research and manufacturing, or investing in employees, most corporations have taken their record profits and bought back shares (raising the per share value of their stock), raised dividends, and given 7 and 8 figure raises to their top executives. If you read the annual reports of profitable companies like Aetna or Bank of America, you’ll see that despite record profits these companies have investing billions less each year in employee costs and benefits for the past several years. They are not letting the economic benefits of an economic recovery trickle down, they are forcing it to pool and concentrate in fewer and fewer hands. 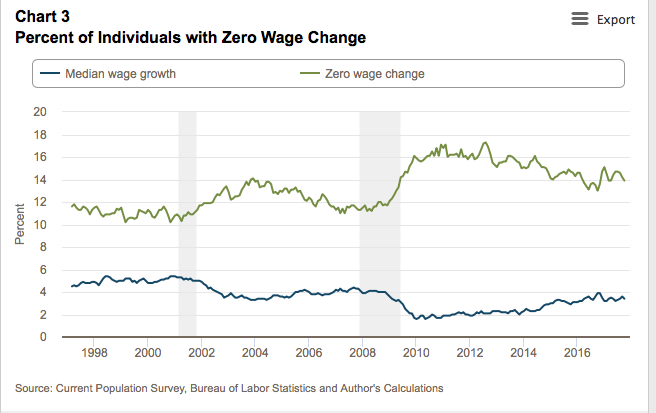 For the past 20 years, between 10%-17% of workers have had 0 wage growth each year. According to recent interviews and surveys, this is what an overwhelming majority of corporations plan to do with the windfall profits they will receive from the GOP tax scam. The $2 billion annual gift to Bank of America will not give us better service, lower fees, cheaper credit card rates, or more options. BOA will not hire more employees, give out larger raises, or make it easier for you to afford a home. The extra $2 billion a year BOA will now bet to keep will simply make those who happen to own BOA stock and their top executives wealthier. This is the fundamental flaw of the trickle down economic theory. Reagan, Bush, Trump and others who have promised us greater prosperity by making the wealthier even wealthier. This theory fails to factor in the never-ending greed that grows with excess. The reason we do not have a balanced budget amendment is that the government needs flexibility to run deficits during times of war, economic downturns, and natural disasters. This is a good and necessary thing. However, for the past 40 years, our Congress has forgotten that the flip side of that is that during times of economic growth, we need to be using the excess revenue to pay back those debts, not using each previous year’s shortfall as an excuse to increase that shortfall the next year. The result of this fiscal irresponsibility from both sides of the aisle is that there is less money for education, health care, social security, and infrastructure. We each get less benefit for each dollar we pay in income taxes because our Congress has been busy giving it away to the wealthy and most profitable companies in the world and today just did it again. In economic terms, anything that deteriorates the purchasing power of what you get in exchange for your goods and services is a tax. We think about income tax because we see it each week taken from our paychecks. Less funding for the US Government means less funding for the states and localities which means we will see increases in the taxes that we do not notice as often since they are not always itemized: fees on hotels and communications lines, gasoline taxes, sales taxes, property taxes… Since these taxes represent a larger portion of a person’s income the less a person makes, these taxes shift the tax burden from the wealthy (income taxes) to working families, the elderly, and the poor (upward wealth redistribution). By stimulating a robust economy at full employment, the inflation that will occur will decrease the purchasing power of working families, the elderly, and the poor which is a hidden tax and again a redistribution of wealth from those who do not have investment income to offset the loss in purchasing power. (more upward wealth redistribution) Finally, the cost of servicing another few trillion dollars in debt means more of our income taxes go to paying principle and interest and less coming back in the goods and services we want our government to provide (education, infrastructure, security, social security, and medical/health care) which by definition makes the deficit also a tax that effects people in inverse proportion to their wealth. 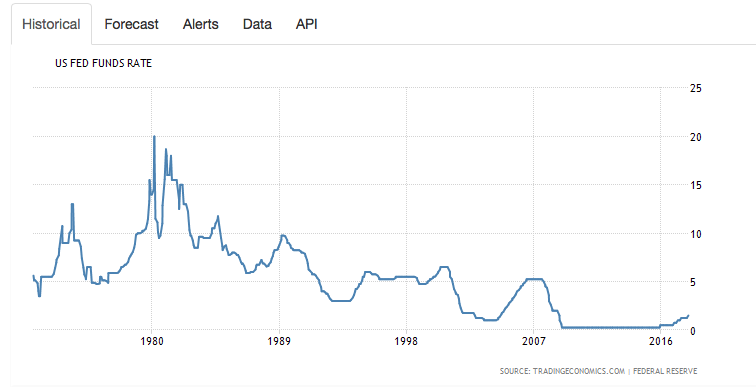 Just prior to the the election, the Fed started to raise interest rates from their historic lows in order to slow growth and start combatting anticipated inflation. They have raised the rate three times this year and intend to raise it three times in 2018. Although I look forward to the $12.50/week that I will enjoy in tax savings for the next 3 years (and can partially fund my Lotto retirement plan since I cannot count on Social Security), the cost to me and most Americans will be far greater than what Dennis Ross and the GOP corporate puppets want to admit. Stimulating the economy at this time makes no economic sense and what little economic relief it brings to those of us who work for a living will lead to tougher times for the majority of Americans. Make no mistake, this tax scam is not good for America, it is not good for most Americans, and is nothing less than giving away our future for more corporate funding in the coming election. 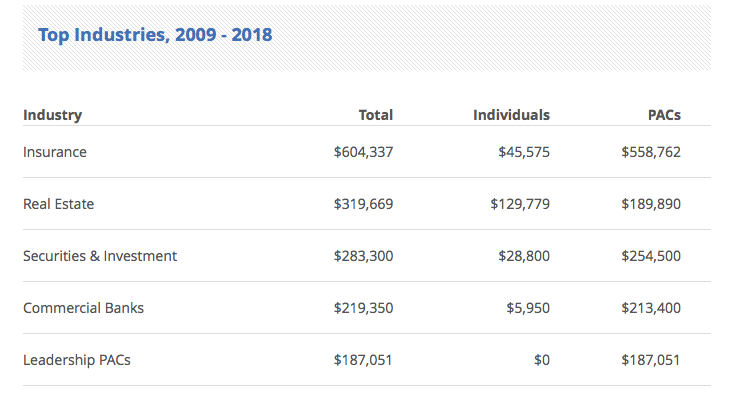 Why did Dennis Ross vote to give your money to corporations? Follow the money. Who owns Dennis Ross’ vote? Insurance companies, banks, and financial institutions.